Guido Nincheri (1885 – 1973) may be the most important religious artist in Canadian history. The enormous range of his output reveals him as a renaissance man, both in his continuance of Italian Renaissance traditions in large murals and architecture, and delightfully, in his Italianate painting style in hundreds of unique stained glass designs. Born in the Tuscan city of Prato, Nincheri showed early artistic talent and won awards at the venerable Academy of Fine Arts in Florence where he studied drawing, painting and sculpture. After graduating from the Academia, Nincheri continued in Florence for several more years, studying the city’s celebrated art and architecture. After a short period in Boston, where he worked on the decoration of the Opera House, he and his young wife immigrated to Montreal in 1914. After he arrived in Montreal, Nincheri was hired by Quebec’s leading church decorator of the day, Henri Perdriau, who introduced him to the craft of fired and leaded glass. Stained glass was not part of the Florentine art tradition, but Nincheri quickly understood the complexities of the medium. 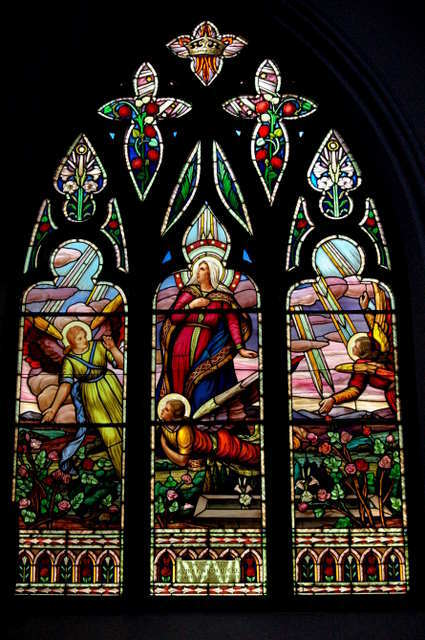 He soon started his own liturgical art studio and by 1924 had embarked on a decade-long project of 125 windows for the Cathedral of the Assumption in Trois-Rivieres. Nincheri created some five thousand stained glass windows in nine Canadian provinces and several American states. In a number of large churches the entire design was his, including the architecture, murals, liturgical objects and, of course, the windows. His legacy of fifteen churches in Montreal includes outstanding creations at Saint Léon of Westmount, Sainte-Madeleine d’Outremont, Très-Saint-Rédempteur and Notre-Dame-du-Rosaire; in Ottawa, Notre Dame Cathedral, Ste. Theresa, St. Patrick’s Basilica and St Anthony’s. Many more of his works are in Ontario, Quebec, the Maritime provinces, Rhode Island and Massachusetts. In Western Canada, his glass can be seen at St. Josaphat Ukrainian Catholic Cathedral in Edmonton, Holy Rosary Cathedral in Vancouver, and St. John the Baptist Church in Estevan, Saskatchewan. Nincheri’s stained glass style is unmistakable. His technique is in the mode of Italian Renaissance painting: dramatic and dynamic but resolutely realistic, at least by 20th century standards. The three-dimensional modeling of his figures is uncommon in stained glass, but Nincheri had the luxury of live models, including his wife Giulia, and sometimes his studio colleagues. His broad colour palette can seem overwhelming until you find the subtleties. A characteristic technique is the depiction of boldly rendered rays, emitting symmetrically from sacred figures like Jesus, Mary and the Angels. His border ornamentation is fresh and harmonious. Nincheri employed skilled Italian and French Canadian artists who remained with him for decades, including Matteo Martirano, his friend and collaborator, who continued the stained glass studio for more than twenty years after Nincheri’s death in 1973. Nincheri received many honours both in Canada and abroad. He was the pride of Montreal’s Italian community, and was knighted by the Italian government in 1972; in 1933 Pope Pius XI honoured him as one of the Church’s great religious artists; Italy declared him a Knight of the Republic; he was made an honorary citizen of Providence, Rhode Island after he had retired there; and posthumously declared a Builder of the City of Montreal. The Department of Canadian Heritage declared Nincheri’s ensemble at Saint Léon of Westmount in Montréal a National Historical Site. One of his stained glass images in Vancouver was featured on a Christmas postage stamp in 1997. In 2001 the exhibition “Guido Nincheri: A Florentine Artist in North America” was mounted in Montréal. A handsome catalogue depicting the range of Nincheri’s work was published in English and French versions.